Get an independent review of Construction Documents for Completeness, Consistency, Coordination and Constructability before you build. You have probably experienced change orders on every project, and you may have come to expect a few. Yet almost every new change order claim from a contractor is unexpected and relates to needs or requirements you thought your construction documents covered. Change order claims can result from information gaps or contradictions, where something that should be shown is not, or where a requirement in one place contradicts a requirement in another, even within the same drawing or specification section. Many claims may be based on a clear enough reading of the drawings and specifications: for example, you needed and wanted a diesel emergency generator, but the project specifications actually call for an emergency generator powered by natural gas, which is not available at the project site. Looking at such a claim, especially when the wrong generator has already been delivered, you are likely to wonder how natural gas found its way into the specifications, when you thought you had been perfectly clear with your project team that you needed and wanted diesel for the project. Change orders – even for seemingly minor items – can be frightfully expensive on a large project, and even the most empathetic clients can become irritated at having to write checks to cover perceived boo-boos. For the Architect or Engineer, such change orders can become time-consuming and embarrassing distractions, and making the call on change order claims can be very difficult. Beyond embarrassment, they can adversely affect repeat business and referrals. Other issues related to the construction documents may go unnoticed during construction and surface as post-construction problems. An independent peer review of construction documents can highlight potential change orders and potential post-construction issues. The independent reviewer sees what the Architect drew or wrote without knowing exactly what the Architect thought to draw or write. 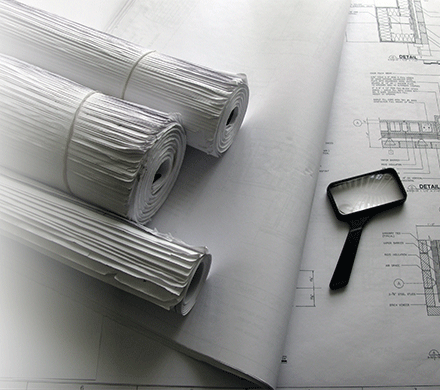 As a fellow architect looking at construction documents, the independent reviewer may recognize the Architect’s design intent and be able to share useful observations about the documents to facilitate the Architect’s effective completion of the documents for bidding and construction. 1. Do the drawing views (plans, elevations, sections, etc.) relate to each other well and come together as a cohesive and coordinated picture of the building? Do the basic views contradict each other? Is cross-referencing coherent? 2. Do the drawings include sufficient views and information to illustrate and convey requirements related to the building enclosure configuration, including recesses, projections, ups and downs, material changes, air barriers and their connections, vapor control layers, and other construction conditions? 3. Are details buildable? Do details allow for a basic, conventional sequence of construction, or do they suggest an impractical approach, requiring, for example, the installation of finish materials before structure? 5. Are consultant drawings coordinated with architectural drawings and with drawings developed by other consultants? a. Are structural levels consistent with architectural levels? Do foundation, top-of-wall, top-of-steel, and deck elevations agree with related architectural information? c. Do the structural drawings include the information referenced on the architectural drawings by notes such as “See Structural”? Conversely, where structural drawings refer to architectural drawings for information, do the architectural drawings include the referenced information? d. Are site utilities drawings coordinated with mechanical, electrical, plumbing, and fire protection (MEP&FP) drawings in terms of utility locations, inverts, sizes, site-to-building connections, and connections by one trade to equipment by another? 6. Are specifications complete and consistent with drawings in terms of materials and products to be used (e.g., if membrane roofing is indicated on the drawings by type, does the type specified agree with the type noted on the drawings)? 7. Are specifications complete with regard to bidding requirements established in applicable public laws (e.g., MGL c.149/149a)? The extent of a peer review of construction documents depends on the budget for the review, the available review time, the condition and completeness of the drawings and specifications, and the agreed scope of the review. The project’s Architect maintains responsibility for the design and deciding how to proceed in response to review comments. See also Constructability Reviews: From the Ground Up and Change Orders: Making the Architect’s Call on Contractor Claims. Request more information or a quote for a specific project. Feel free to ask for references.